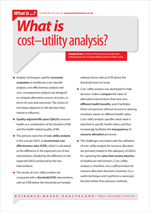 What is cost-utility analysis? | Whatis Series...? Analytic techniques used for economic evaluation in healthcare (cost–benefit analysis, cost-effectiveness analysis and cost–consequences analysis) are designed to compare alternative courses of action, in terms of costs and outcomes. The choice of technique depends on the decision they intend to influence. The results of cost–utility analysis are compared with a threshold ICER; interventions with an ICER below this threshold are funded, whereas those with an ICER above the threshold tend not to be. Cost-utility analysis was developed to help decision-makers compare the value of alternative interventions that have very different health benefits, and it facilitates these comparisons without recourse to placing monetary values on different health states. Cost–utility analysis specifies what value is attached to specific health states, and thus increasingly facilitates the transparency of resource allocation processes.